Each year in the spring, as of now it’s the first weekend in May, my husband and I travel to Manchester, VT to the Northshire Book Store for Booktopia. In addition to being a destination book store, it is a hub of the community it serves. And for one glorious weekend each year, it becomes the community center for Booktopians, as we come together and talk books—all weekend long. For me, it’s as if I’m returning to the mother ship. As we’ve done this year after year, I look forward to talking to the children’s bookseller, Aubrey, to talk about what’s new in YA and what’s coming out. She has amazing taste, and at least one of her selections each spring becomes theYA book I see every summer. 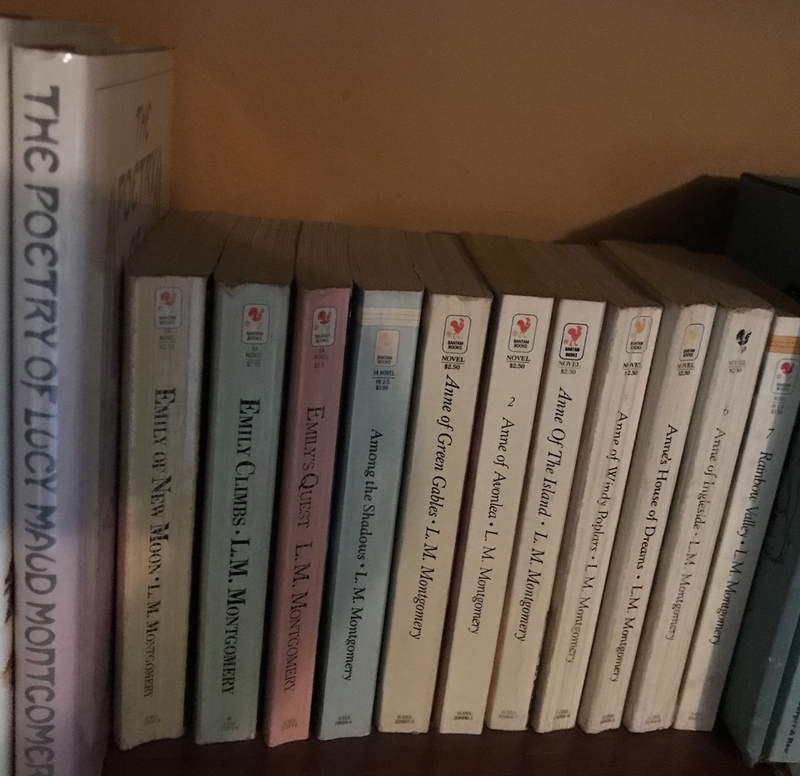 This year, it was Dred Nation, which I will admit, dear reader, that I have sitting in a pile in my home library (yes, reading is that much of a lifestyle). I look forward to digging into that book when I return home from vacation. Which is what leads me today’s post. As I’ve said reading is a lifestyle, and so our vacation absolutely should somehow revolve around reading. This year, we’re heading to Nova Scotia and Prince Edward Island, Canada. While I’m looking forward to Halifax and the bookstores the city has to offer (Americans, we can learn a lot from the number of indy bookstores in this one city), it is PEI that holds the charm for me. Laura Ingalls and her independent spirit grabbed my attention in first grade, but it was meeting Anne Shirley in sixth grade that made me love strong, independent female characters (and probably sparked my love of Jane Eyre in high school—yes, Jane and Anne have completely different temperaments, but they are not so far apart in character traits—and later Elizabeth Bennett and other Austen protagonists). In short Anne Shirley was a gateway drug. 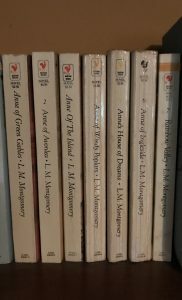 I found myself so captivated by Anne and Green Gables when I was 11 that I couldn’t wait to read the next book and the next book and the next book. And that is when my problems truly began. First, I wanted to own the books. This was not a huge deal because book buying was something I did from a very early age. Each Saturday, my mom, my aunt, my nana, my brother (at least until he was old enough to not have to go), and I would head out for an adventure—an adventure that usually involved luncheon (and probably to make me happy, a book store). If the weather was terrible, we were most likely in a mall somewhere because back then each mall had a different array of stores. They weren’t simply cookie cutters of each other. I preferred B. Dalton to Walden Books, but I really, really loved the Doubleday at the Short Hills Mall or if we happened upon a Bretano’s. My early reading life was truly influenced by B. Dalton and Walden Books. And each Saturday as we embarked on our adventure, I was allowed to take $2.00 (later it became $5.00, and by middle school it was babysitting money), so I could purchase something—if I wanted. I usually came home with a book. Sometimes a Smurf, but usually a book. However, this post is about Anne Shirley, and so I’ll get back to where I started. I returned Anne of Green Gables to my middle school library, and quickly purchased and reread a copy of my own. Then I read the second book, Anne of Avonlea. When I finished the second book, I purchased the third, Anne of the Island. And this is where I thought Anne’s journey ended because the first three books were the only ones that bookstores carried. I got to the end of third book and realized there were five more books. The only problem was I couldn’t get them. 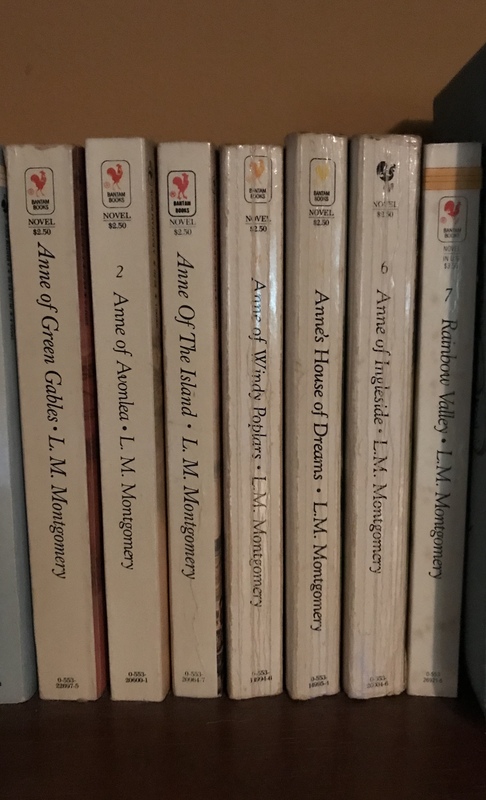 My library—school and public—only had Anne of Green Gables. Every bookstore in a 60 mile radius of my house had the first three books. My aunt and I would scoured every book store we entered and inevitably ask for the book. For whatever reason, mall bookstores weren’t offering to order books. And thus, Aunt and I created a demand; we were a two-woman Anne Shirley army. And lo and behold, one day the fourth book, Anne of Windy Poplars, showed up in the book store! Knowing this was going to take awhile, we immediately began requesting the next book, and when that would show up, the next. It took a while but by the end of middle school, I had not only collected the whole series, but I read the whole series. (I wish I still had the notebook where I recorded all the books I read, the date finished, and the star rating—I was a Goodreads before there was even an internet—I know exactly how long it took.) At was somewhere around book number six or seven, that I discovered L.M. 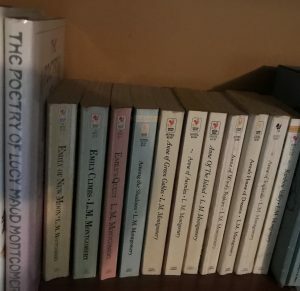 Montgomery had written another series—Emily of New Moon. And thus, I began my hunt for that trilogy. I finally tracked down Emily when I was in high school. And so the last family vacation I went on, the summer between my first and second year in college, we went to Nova Scotia and PEI. Despite 80 years passing between Montgomery publishing Anne and my visit, the place looked exactly the way I pictured it. We visited her home, I took some pictures—but really I was just taking it all in and living the moment. Before smart phones, I suppose this is what we did. It was a great trip. A trip I had all but forgotten about until Heather at Craftlit announced that our next book was going to be Anne of Green Gables. I began listening to the book and was worried how Anne would hold up after all these years. First, Kim Zuckert narrates a perfect Anne. Secondly, the book does hold up. Anne is still strong, funny, smart, kind, and just the perfect female protagonist. When it was time to think about vacation, maybe it was listening to the book that made me think PEI or maybe it was because we had just purchased Sarah McLaughlin concert tickets that made me think Nova Scotia. Whatever it was, we decided that it was time to go to Nova Scotia and PEI. And so gentle reader, I apologize if you feel inundated by Anne posts over the next few weeks as we travel, but I’m going to Anne country, and I’m a reader, so both are a natural fit. Until next time, See Y.A.